This article was originally published by the Norwegian Institute of International Affairs (NUPI) in 2018. Nordic Defence Cooperation (NORDEFCO) was originally about cost-effectiveness. The Nordic states sought to work together when training and educating their soldiers, procuring new equipment, and logistically supporting their forces. Faced with a relevantly benign security situation at home, with Russia regarded in principle as a partner, operational military cooperation was primarily about expeditionary operations far from northern Europe. Even if NORDEFCO never became the beacon of Nordic cooperation that some political speeches sought to paint it as, it nonetheless provided the Nordics with a flexible and non-bureaucratic framework through which various forms of defence cooperation could be pursued. In December 2009, the Nordic defence ministers established NORDEFCO as a cooperative structure by merging three existing Nordic frameworks for military cooperation. Its primary raison d’être was to ‘produce national military capabilities in a more cost-efficient way by means of multinational cooperation’.3 The framework was to complement cooperation in NATO and the EU. All the Nordic states have today come to regard Russia’s revisionist challenge to the post-Cold War status quo as the greatest challenge to their security. The Nordic states generally perceive their security to have deteriorated mainly, but not exclusively, due to Russia’s illegal annexation of Crimea, military intervention in eastern Ukraine, and increasingly aggressive military behaviour.9 In a joint op-ed published in 2015, the Norwegian, Swedish, Danish, and Finnish ministers of defence and the Icelandic foreign minister argued that after Crimea it was ‘no longer business as usual’. The Nordic countries were now faced with ‘a new normality’.10 The ministers argued that their countries should meet this situation with solidarity and enhanced cooperation in order to improve their security, complementing NATO and the EU. They specified that they should work towards being ‘able to act together in a crisis’.11 Since then, Russian military activity in the Nordic-Baltic region has continued on a high level: Unannounced snap exercises, deployment of new weapons systems, and simulated air attacks all have contributed to a shared concern for Nordic security and stability. It is today a shared opinion among Nordic security practitioners that the new security situation faced by the Nordic states is – and should be – a key driver for contemporary Nordic defence cooperation.12 Since 2014, the Nordic states have undertaken several new initiatives to address this deteriorated security situation. Nordic officials stress the importance of strengthening transatlantic ties to meet the new security situation. This applies equally for militarily non-aligned Sweden and Finland and for NATO members Norway and Denmark.17 Nordic cooperation is not perceived in any country as a viable security policy alternative in and of itself, but only as a supplement to NATO, the EU, and strong ties with the US. This has made Nordic cooperation easier. Nordic cooperation can no longer be construed as neutralist, and it serves de facto as another vehicle for tying the militarily non-aligned countries closer to the US and NATO. In practical terms, institutionally, this means having Sweden and Finland sign host nation support agreements with NATO and join the enhanced opportunities partnership of the Alliance. It also means contributing Swedish and Finnish troops to the NATO Response Force (NRF) and the UK-led Joint Expeditionary Force (JEF). This in turn aligns the Nordic states more closely, since Norway and Denmark already participate in these formats. Strengthening transatlantic ties also means increasing US involvement in Nordic exercises. For example, the Norwegian, Swedish, and Finnish-led Artic Challenge Exercise (ACE), which is now one of the largest air exercises in Europe – in 2017 it involved more than 1,000 personnel and 100 aircraft – has seen a marked increase in US and Western participation.18 Recent major national exercises, such as Norway’s Cold Response and Sweden’s Exercise Aurora 17, have also seen large-scale participation not only from the Nordic states but also from the US and a number of European NATO states. Nordic officials generally express satisfaction with training and exercises as something which both works well and which should be developed further. If they disagree on anything with regard to the US, is it perhaps the extent to which the ‘Nordic family’ should strive to act as a unified block and speak with one voice vis-à-vis Washington. While most agree that greater unity would give more presence and influence, the low-key ‘beauty contest’ to be Washington’s number one Nordic ally or partner makes this difficult. The alternate landing base agreement is a similar case in point. By 2017 all the Nordic states had signed the agreement, allowing unarmed aircraft to use each other’s air bases, for example in case of poor weather conditions. There are currently ongoing discussions to extend the agreement to included armed aircraft,22 and there is a strong willingness among officials to explore the prospects for extending it into crisis and war. This would potentially generate important operational benefits, but could become politically challenging, particularly for non-aligned Sweden and Finland. Norwegian and Danish Quick Reaction Alert aircraft are directed by NATO headquarters as part of Alliance air policing. The Nordic states struggle with fear of entrapment and abandonment.23 On the one hand, the Nordic NATO states worry about making themselves dependent upon these arrangements, only to see radar screens go dark and landing rights be withdrawn in a crisis. Conversely, Sweden and Finland worry about losing their national freedom of action to – at least theoretically – keep out of a conflict.24 By nevertheless establishing these arrangements in peacetime, the Nordic states aim to reap at least some benefits, build trust and familiarity, and slowly work towards extending them beyond peacetime in the future. Nordic officials unanimously expressed disappointment and regret with regard to the poor state of cooperation on the joint acquisition of materiel and the joint development of military capabilities. When NORDEFCO was established, ‘significant savings’ were expected to be generated as a result of bilateral, trilateral, and Nordic procurement projects and joint capability development.25 However, many of these projects either did not materialise or resulted in failures.26 Norwegian-Swedish joint projects proved particularly challenging, resulting in some hurt feelings on both sides.27 To date, the only successful Nordic armament project to emerge is an agreement to procure a Nordic Combat Uniform. There are many reasons for the failed procurement processes. Some are legal-bureaucratic: the Nordic countries often have different procedures and requirements in terms of public tenders, transparency, risk management, repurchase agreements, etc. Furthermore, the organisations involved are not necessarily equivalent in terms of competencies, and decision-making processes may be more cumbersome in some countries than in others. On the other end of the spectrum are the political obstacles: strategic questions related to a potential preference for trade with NATO allies vs. a preference to support national industries. Taken together, these challenges have often proved insurmountable. Increased defence industrial cooperation within the EU, including the Permanent Structured Cooperation (PESCO), could prove a new challenge for non-EU member Norway’s cooperation with Sweden and Finland. NORDEFCO’s present structure is a legacy from its inception at a time when the ambition was ‘system similarity’ by way of joint development, acquisition, logistics, and training.28 Some Nordic officials have suggested revising NORDEFCO’s structure to better reflect present day realities. The cooperation area (COPA) of ‘armaments’ could, for example, be discontinued or amalgamated with that of ‘capabilities’, thereby uncluttering and streamlining NORDEFCO. However, most argue that the present structure – and the COPAs – has established its own traditions and cultures and produces some value, that revising the structure would cost resources, and that discontinuing or amalgamating COPAs would result in little savings. However, all agree that joint procurement is not easy and that this area of cooperation has not progressed as desired. Nordic defence cooperation is today increasingly about cooperating in the Nordic region in peacetime, crisis, and war. Although NORDEFCO’s structure was designed in a different time, it is sufficiently agile that there is little desire to alter it. More use of secure videoconferencing (VTC) between the capitals could facilitate more seamless ‘out of cycle’ decision-making in NORDEFCO and advance the dialogue on security policy even further. Building on the successful scenario-driven table top exercise – which should be repeated – VTC could also be utilised by defence ministries and the operational headquarters to practice dealing with politico-military incidents in the Nordic-Baltic region. Routines for political and military consultations and information exchange could be established. The Nordic countries should continue working to extend many of the agreements and arrangements that now only apply in peacetime into times of crisis and war. There is a strong will among Nordic officials to move in this direction. Swedish and Finnish membership in NATO, unlikely in the short term, would make this considerably easier. These countries could then take part in planning and preparations for Alliance collective defence. Opportunities for new agreements that improve cooperation in times of crisis in other areas, for example on military or civilian security of supply, should be explored and pursued. Involving the US as well as other key countries – especially the UK and Germany – more in Nordic-Baltic security is a shared objective for all the Nordic states. These countries are therefore regularly invited to take part in Nordic military exercises. 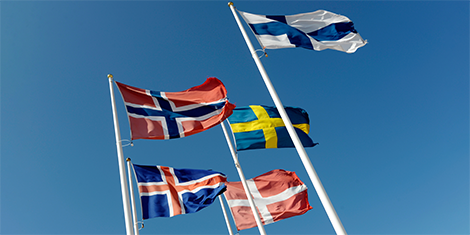 As far as it is practically possible, the Nordic countries should consider also involving these key countries in policy dialogue and table top exercises. There is no desire for a standing NORDEFCO secretariat, which would potentially be costly, but the present model of rotational chairmanship suffers from limited institutional memory. Establishing a shared secure cloud storage for unclassified documents – a ‘Nordic Drop Box’ – could be one technical solution to improve matters. Today’s Nordic Defence Cooperation is driven by a shared understanding of the increasing regional security challenges, a shared interest in jointly meeting them, and a shared recognition that the Nordic format can only complement cooperation in NATO and the EU and with the US. There is also a sense of community and closeness among the Nordic countries, and there is broad political and popular support for more Nordic cooperation. Security and defence cooperation is limited, however, by a factor unlikely to disappear tomorrow, namely these countries’ continuing security policy differences (NATO membership or military non-alignment). 1) Between 15 February and 22 March 2018, a total of seven interviews with 11 military and civilian officials were conducted in Stockholm, Helsinki, Copenhagen and Oslo. Interviewees were drawn from the Swedish Ministry of Defence, Swedish Armed Forces Headquarters, Finnish Ministry of Defence, Danish Ministry of Defence, the Norwegian Defence Staff and the Norwegian Ministry of Defence. 2) Uniquely among the Nordic countries – and in NATO – Iceland has no armed forces. Iceland therefore only participates in the political but not the military parts of NORDEFCO. 3) Arne Røksund, ‘A word from the MCC chairman’, in NORDEFCO Military Level Annual Report 2010, ed. NORDEFCO (Oslo: Norwegian Armed Forces, 2011): 4. 4) Norwegian and Swedish Chiefs of Defence, Ömsesidgt förstärkande försvarslösningar: Norsk-svensk studie av möjligheterna till fördjupat samarbete [Mutual reinforcing defence solutions: A Norwegian-Swedish study of the possibilities for strengthened co-operation] (Oslo and Stockholm: Norwegian and Swedish Armed Forces, 2007). 5) NORDSUP, Nordic Supportive Defence Structures (NORDSUP) – Progress Report (Oslo: Norwegian MoD, 2008). 6) Denmark, which did not share this view, stayed aloof. Håkon Lunde Saxi, Nordic Defence Cooperation after the Cold War, Oslo Files on Defence and Security no. 1 (Oslo: Norwegian Institute for Defence Studies, March 2011): 55–57. 7) NORDSUP, Nordic Supportive Defence Structures (NORDSUP) – Progress Report: 2. 8) Håkon Lunde Saxi, ‘Hvordan revitalisere NORDEFCO? En statusrapport og noen konkrete tiltak for å styrke samarbeidet i hverdagen’, in Nordisk Forsvarssamarbejde 2016: Vilkår og muligheder, ed. Mikkel Storm Jensen (København: Forsvarsakademiet, 2016). 10) Ine Eriksen Søreide et al., ‘Vi må forholde oss til Russlands handlemåte, ikke Kremls retorikk’ [We must deal with Russia’s way of acting, not the Kremlin’s rhetoric], Aftenposten Morgen, 10 April 2015. 12) All civilian and military officials interviewed stressed the new security situation as the key driver for contemporary Nordic military cooperation. 13) NORDEFCO, Annual Report 2014 (Oslo: The Norwegian chairmanship of NORDEFCO, February 2015): 7. 14) Annual Report 2015 (Stockholm: Swedish Ministry of Defence, January 2016): 7, 28. 15) Annual Report 2016 (Copenhagen: Danish Ministry of Defence, 2017): 10. 16) Annual Report 2017 (Helsinki: Finnish Ministry of Defence, 2018): 8. Emphasis added. 17) After joining the EU in 1995 Sweden and Finland utilised the term ‘military non-alignment’ in place of ‘neutrality’. Since 2007 Finland has ceased to use the term, stating only that Finland does not belong to any military alliance. Mats Bergquist et al., The Effects of Finland’s Possible NATO Membership: An Assessment (Helsinki: Ministry for Foreign Affairs of Finland, 2016): 10, 45. 18) NORDEFCO, Annual Report 2017: 3, 6, 18. 21) Krister Bringéus, Säkerhet i ny tid: Betänkande av Utredningen om Sveriges försvars- och säkerhetspolitiska samarbeten [Security in a new era: Report by the Inquiry on Sweden’s International Defence and Security Cooperation], SOU 2016:57 (Stockholm: Swedish Ministry for Foreign Affairs, 2016): 14-15. 22) NORDEFCO, Annual Report 2016: 6, 10; Annual Report 2017: 7. 23) Glenn H. Snyder, ‘The Security Dilemma in Alliance Politics’, World Politics 36, no. 4, 1984. 24) On the Swedish, but also Finnish, domestic (strategic) debate for continued military non-alignment, see Dalsjö, Trapped in the Twilight Zone. Sweden between neutrality and NATO (2017); Swedish studies have concluded that it is unlikely that Sweden could stay out of a NATO-Russian conflict. See Bringéus, Säkerhet i ny tid: Betänkande av Utredningen om Sveriges försvars- och säkerhetspolitiska samarbeten [Security in a new era: Report by the Inquiry on Sweden’s International Defence and Security Cooperation]: 13. 25) NORDEFCO, Annual Report 2010 (Oslo: Norwegian Armed Forces, February 2011): 4, 12. 26) Saxi, ‘Hvordan revitalisere NORDEFCO? En statusrapport og noen konkrete tiltak for å styrke samarbeidet i hverdagen’: 62–75. 27) Karsten Friis and Maren Garberg Bredesen, Swedish–Norwegian Defence Cooperation: New opportunities?, NUPI Policy Brief 7/2017 (Oslo: Norwegian Institute of International Affairs, 2017): 2; Norwegian-Finnish defence industrial relations have proven more successful. 28) The term ‘system similarity’ was used frequently in NORDEFCO’s ambitious early years, but is today no longer to be found in NORDEFCO’s annual reports and is seldom mentioned by Nordic officials. Bergquist, Mats, François Heisbourg, René Nyberg, and Teija Tiilikainen. The Effects of Finland’s Possible NATO Membership: An Assessment. Helsinki: Ministry for Foreign Affairs of Finland, 2016. Bringéus, Krister. Säkerhet i ny tid: Betänkande av Utredningen om Sveriges försvars- och säkerhetspolitiska samarbeten [Security in a new era: Report by the Inquiry on Sweden’s International Defence and Security Cooperation]. SOU 2016:57. Stockholm: Swedish Ministry for Foreign Affairs, 2016. Frear, Thomas, Łukasz Kulesa, and Ian Kearns. Dangerous Brinkmanship: Close Military Encounters Between Russia and the West in 2014. London: European Leadership Network, November 2014. Friis, Karsten, and Maren Garberg Bredesen. ‘Swedish–Norwegian Defence Cooperation: New opportunities?’ In NUPI Policy Brief. Oslo: Norwegian Institute of International Affairs, 2017. NORDEFCO. Annual Report 2010. Oslo: Norwegian Armed Forces, February 2011. ———. Annual Report 2014. Oslo: The Norwegian chairmanship of NORDEFCO, February 2015. ———. Annual Report 2015. Stockholm: Swedish Ministry of Defence, January 2016. ———. Annual Report 2016. Copenhagen: Danish Ministry of Defence, 2017. ———. Annual Report 2017. Helsinki: Finnish Ministry of Defence, 2018. NORDSUP. Nordic Supportive Defence Structures (NORDSUP) – Progress Report. Oslo: Norwegian MoD, 2008. Norwegian and Swedish Chiefs of Defence. Ömsesidgt förstärkande försvarslösningar: Norsk-svensk studie av möjligheterna till fördjupat samarbete [Mutual reinforcing defence solutions: A Norwegian-Swedish study of the possibilities for strengthened co-operation]. Oslo and Stockholm: Norwegian and Swedish Armed Forces, 2007. Røksund, Arne. ‘A word from the MCC chairman’. In NORDEFCO Military Level Annual Report 2010, edited by NORDEFCO. Oslo: Norwegian Armed Forces, 2011. Saxi, Håkon Lunde. ‘Hvordan revitalisere NORDEFCO? En statusrapport og noen konkrete tiltak for å styrke samarbeidet i hverdagen’. In Nordisk Forsvarssamarbejde 2016: Vilkår og muligheder, edited by Mikkel Storm Jensen. København: Forsvarsakademiet, 2016. ———. Nordic Defence Cooperation after the Cold War. Oslo Files on Defence and Security no. 1. Oslo: Norwegian Institute for Defence Studies, March 2011. Snyder, Glenn H. ‘The Security Dilemma in Alliance Politics’. World Politics 36, no. 4 (1984): 461–495. Søreide, Ine Eriksen, Nicolai Wammen, Carl Haglund, Gunnar Bragi Sveinsson, and Peter Hultqvist. ‘Vi må forholde oss til Russlands handlemåte, ikke Kremls retorikk’ [We must deal with Russia’s way of acting, not the Kremlin’s rhetoric]. Aftenposten Morgen, 10 April 2015. Håkon Lunde Saxi is Senior Fellow at the Norwegian Institute for Defence Studies (IFS) in Oslo. Karsten Friis is Head of the Research group for security and defence at the Norwegian Institute of International Affairs (NUPI) in Oslo. NORDEFCO need to fixed their mind regarding this matter. There are no known threats yet to them. But if cooperation is not an option then they may be subject for attacks of person who wants them to be disunited.